Gravity Salon Professionals is staffed exclusively by Senior and Master Colourists and Stylists who all have more than a decade of experience under their belts with advanced cutting and styling methods and precise colour placement. Gravity’s talented stylists pride themselves on being up-to-date with all of the latest hair trends and styles, including balayage, highlights, creative colouring and contemporary cutting techniques. Gravity Salon is a Goldwell-exclusive salon, ensuring that each and every one of our guests gets their beautiful locks pampered with premium-quality colouring and styling products. Goldwell is a professional colour and haircare line that creates top of the line innovative professional hair products such as Elumen, BondPro and Pure Pigments; as well as salon-quality styling products that you can purchase right here at Gravity to help you incorporate your salon-fresh look into your everyday hair regimen. Alongside all of Gravity’s amazing Goldwell styling products, it is also fully-stocked with styling products from the professional salon styling brand KMS. KMS carries an array of professional hair products, and has a number of different lines for all different hair types to ensure that there is a little bit of something for everyone! If you are interested in purchasing any salon products, make sure that you consult with your stylist next time you are in to figured out what is best for you! Gravity stylists are happy to service all of your hair needs from hair colour to men’s cuts and even just simple blow-outs that you can learn how to do right at home! Gravity stylists understand that every client’s hair is unique in its own way and will always take the time to listen to you and familiarize themselves with your hair to ensure that your colour or style are always best-suited for you. 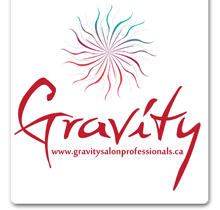 Gravity’s stylist’s skill, experience and expertise is only part of the reason why Gravity has been voted Barrie’s Best Salon for two years in a row, and we can’t wait for you to come in and experience it for youselves!